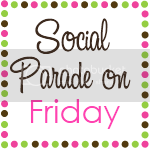 I'm joining Smart and Trendy Moms for her weekly Social Parade on Friday Blog Hop. Go over to her site and join the Hop!! Sixteen years ago today, I woke and was upset to see that it was raining. But there it was...rain coming down. I got dressed any way and headed to breakfast all depressed. Then I looked out the big picture windows and the rain had all but stopped! People were showing up, coming and going, and my mother reminded me that Jodi and I had to get going if we were going to get our hair done in time. So we drove down town to Phyllis' shop. I had never had so much hairspray in my hair!! Phyllis said she was not going to have all the humidity in the air let my hair fall. Not this day! She literally used a whole can in my hair!! I was shocked! My hair had NEVER looked this good! Jodi and I made it home and I started getting ready. Michelle came in and did my makeup. I wasn't much on wearing makeup and she and Jodi knew it. They made sure my makeup was the best it had ever been. I looked in the mirror and didn't really know who was looking back at me! We headed outside for pictures. That's when we saw each other for the first time. He was so handsome in his suit coat and hat! He took my breath away! I think I took his breath away too, because it took him a minute to say anything! I remember taking all kinds of family and individual pictures. And it seemed to go so fast!! I remember my daddy looking so handsome! Better than I ever remember him looking. He seemed so proud but lost for words. He couldn't look at me and I couldn't look at him! He held my arm so tight. And we almost ran into the room. There wasn't a large crowd but an important crowd. For 16 years I have created a wonderful life with a man who is my best friend. I can't even image what my life would be without him in it! Thank goodness I had the guts to ask him out all those years ago, especially since he was too scared too! Oh - what a beautiful story! congrats on your 16 years!!! What a fun blog you have here! I'm a new follower, will you follow me? Hey there! I am following you back. Thanks so much for stopping by! Have a great weekend! Following you now from Frugal Free Gal blog hop. My blog “Inspire” has inspiring messages. Please follow back! What a great post! I am sure that it has been a wonderful 16 years thus far, and many more years to come. Have a lovely weekend.